I lived in Kennesaw, a neighborhood of Georgia just north of Atlanta, from 1984 to the summer of 1997. 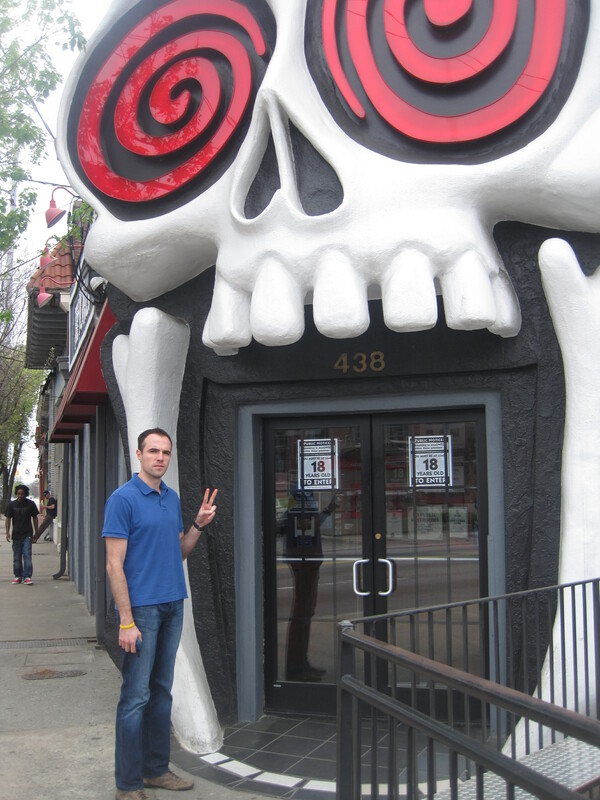 I spent the most formative of those years at J.T. 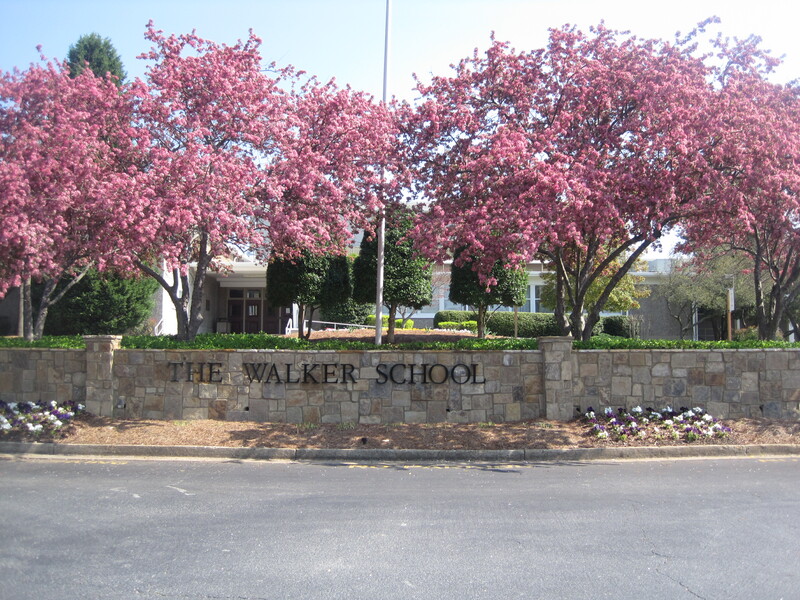 Walker School, a private school on Parkway 41 in Marietta. During middle school, I made my first group of friends only to leave them at the end of 8th grade. It was a particularly difficult time for me because I had just become aware of the value of friends. I guess it would be accurate to say I had taken them for granted until I was faced with the very real possibility of never seeing them again. This sudden cognizance became an additional obstacle in the process of settling in a new country. Despite a few weeklong visits in the summers to come, it was clear that everyone, myself included, was moving on. But many years later, thanks to the reticulated clutches of AIM and much later Facebook, we were no longer completely uninformed of each other’s lives. 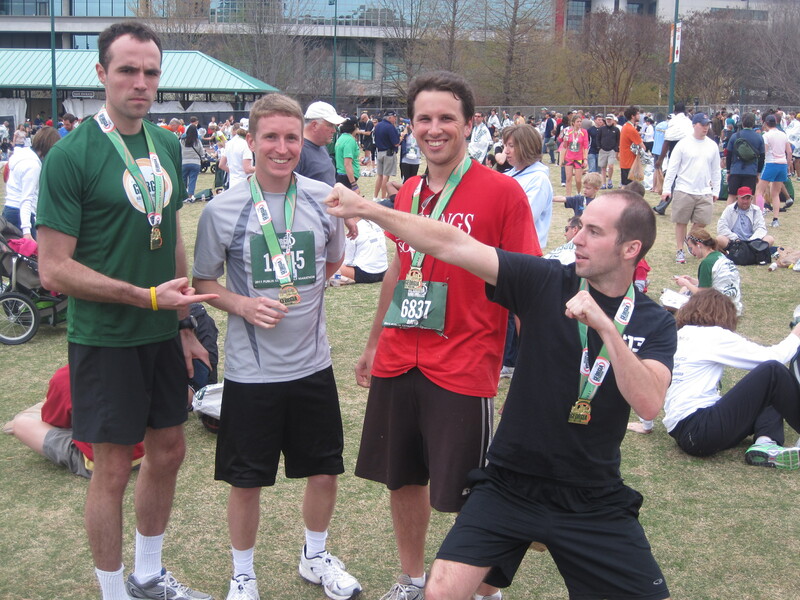 Now we fast-forward to the beginning of the year, when I learn that Brian and Nolan, two of my best friends from that era, had independently signed up for the 2011 Publix Georgia Half Marathon. It felt very serendipitous, especially since they themselves had not kept in touch with each other since graduating from high school. Without hesitating, I made plans to run the race and simultaneously take a disorienting trip down memory lane. Before any racing could happen, I had to get down to catching-up with these kids. Regrettably, Brian had just come down with something and was under lockdown for the weekend, so we were unable to see him. Nolan played the role of gracious host for the weekend, letting me crash with him and his fat Manx cat, who he affectionately calls “Cat.” We drove up to Walker on Saturday and walked around the school campus, hashing out a few hazy memories and unreliably piecing together where everything used to be. It was very trippy. In recent years, my recollections of Walker were all very hazy, almost dreamlike. In a strange way, walking through the empty halls of the school confirmed the fact that I was once a student there. Time can distance you from something so much that you feel like the gap between becomes completely unbridgeable. So it’s a warm feeling when you realize it just takes a stroll to feel comfortable again. That night we went to another 8th grade former classmate’s house. Alex Demestihas, his wife, two brothers and seventeen dogs played host after finishing an excellent landscaping project on the backyard. The highlight (no pun intended) of the night was the anticipation and eventual beholding of the Supermoon, which we all agreed was anticlimactic because it didn’t blind us or show up with an angry face or show Jesus riding it on a saddle made of plutonium. The next morning, I woke up at 4:10 AM and began my regular morning ritual. I was even up before Cat could gurgle in my ears like he did the night before. Nolan’s friend David and his friend Josh arrived just before 6 and the four of us were off toward the starting line at Centennial Olympic Park. 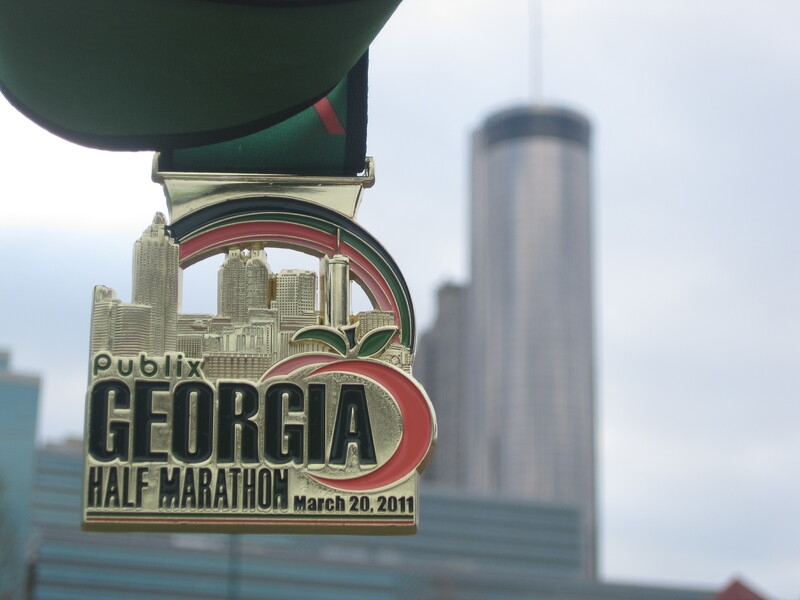 The race started right on time at 7 AM with a downhill dash through the streets of downtown Atlanta. From there, it turns north onto Piedmont Avenue and later turns back south toward Old Fourth Ward, where crowd support was plenty and loud. All weather predictions had forecasted low 50’s for Sunday but Saturday was crazy hot for March and kept the morning temperatures hovering around 63ºF. The humidity was also a bit high, so those first two or three urban miles weren’t good harbingers of good luck. I was pretty worried going into mile 4 that I wasn’t going to be able to secure a good time, mostly because of the uphills. However, it wasn’t long before breezes cut across the course. Around then, the course continues east toward Inman Park and Little Five Points before entering the Carter Center, the landmark that boasted the steepest hill. Once at the top of the hill, it basically slopes immediately back down at a very sharp incline, which made it impossible to descend at a regular pace. In fact, my pace was wild. Since the course has very few stretches of consistently flat road, I employed my Austin strategy of killing it on the downhills just enough to keep a good average pace after slogging back up. To my relief, the hills weren’t at all steep, just numerous. Prior to running, we had seen various landmarks that would dot the course, so despite my pathetic sense of orientation and direction, I got a good feel for where I was the whole time. It was a very scenic and varied course that never lost sight of the city, which reminded me a lot of Boston’s Run to Remember. At mile 7 the course turns north on Highland Avenue and later west on Virginia Avenue. This was the point where I began strategizing. We had all studied the elevation chart beforehand and knew the last two miles of the race were going to be mostly uphill. If I planned on that inevitable slowdown I would have to put in some fast miles as a cushion. 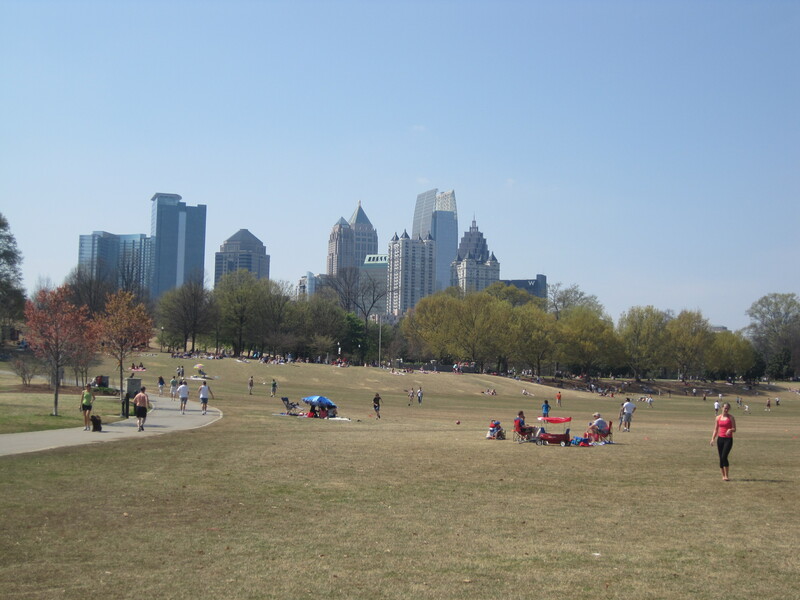 So once on Park Drive, where the course enters the recreational haven known as Piedmont Park, I had logged two sub-7:20 splits on my way to the worst miles. After exiting Piedmont Park on 10th Street, the course veers southwest towards Georgia Tech’s campus and passes the Coca-Cola building, where my dad worked for several years in the 80’s. It then makes a 270-degree turn onto Marietta Street for the final stretch. Nolan and I both benefited from dramatically over-inflating the grueling climb we’d be facing at the end because that last mile uphill wasn’t as nightmarish as we had thought. However, I felt under the gun by my watch. A PR wasn’t in the cards, but if I wanted to beat my Austin time, I had to run a relatively fast 13th mile and scorch the end. I was feeling the burn in my legs but not to the point that I couldn’t kick a little harder. So I went for it, passing many runners on that smooth uphill until reaching Centennial Olympic Park. As a welcome reward, the final 0.1 mile sprint was all downhill, allowing me to sneak in just under 1:40 (1:39:56) for my third fastest time. This was Nolan’s second race at this distance, having finished the 2010 Atlanta Half Marathon last Thanksgiving. However, he put in serious training for the Publix run, so he was out to validate his efforts … and validate he did to the tune of a 6-minute improvement, finishing in 1:46:30. Josh finished his debut half shortly afterward in just over 1:52 with David “D-Rob” Robinson triumphantly boasting a no-training finish in 2:21. After the luster of finishing wore off, we walked back to the car and drove home. 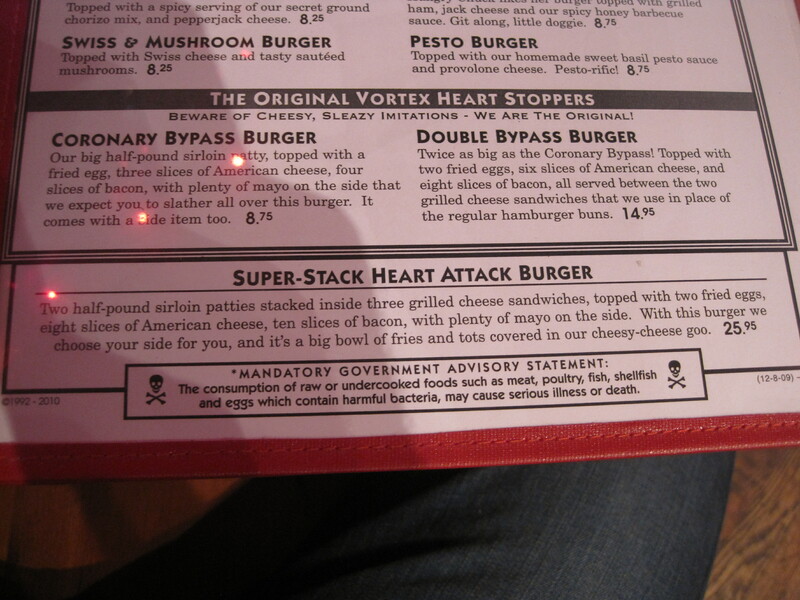 The post-race bloodlust for a greasy burger led us to Vortex, a local burger joint that proudly swanks three artery-clogging burgers: the Coronary Bypass, the Double Bypass and the unimaginably heart stopping slop fest known as the Super-Stack Heart Attack Burger (read the description below – it’s a mess). Since we had just run a half marathon, we felt entitled to these prizes. But since we had run just a half marathon, we went for the Coronary Bypass and avoided the more serious threats to our health. With ten states under my belt, I’m a fifth of the way through this fun journey. But more importantly, I got a chance to touch base with someone I hadn’t seen in over ten years. This weekend I have my first international race in Costa Rica, for which I will never truly be prepared. On that note, I’m back to hitting the pavement. Jime — gracias por el comentario! Ya hice carrera en Missouri pero como me falta Kansas, definitivamente te voy a mandar un mensaje. Espero que todo siga bien – un abrazo! Sweet medal picture! And we all know that’s the most important part. 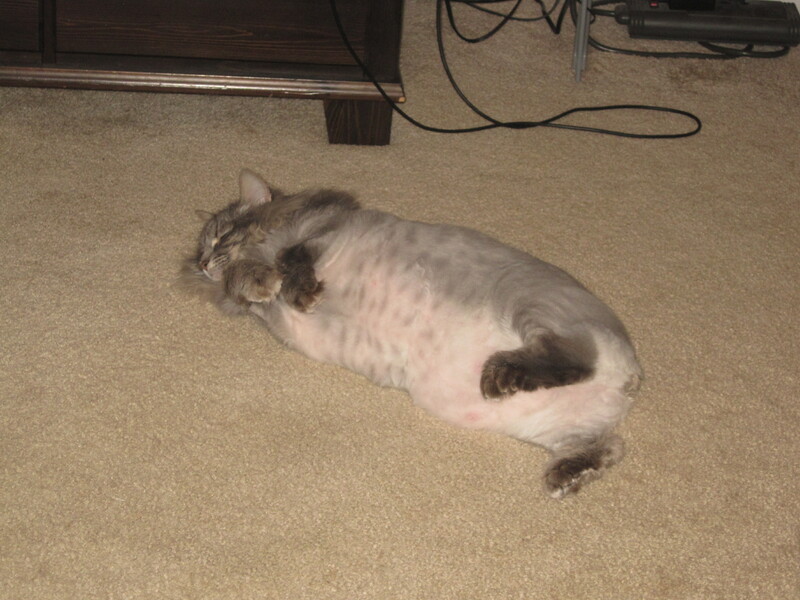 Also, Cat could CRUSH Penny. Serendipity was a GREAT movie. Good seeing you Dan, and congrats on the races. Let me know next time you find yourself ATL bound. Whenever you decide to run Alabama, Tennessee, the Carolinas, etc., keep me in the loop! Good luck on your next race!